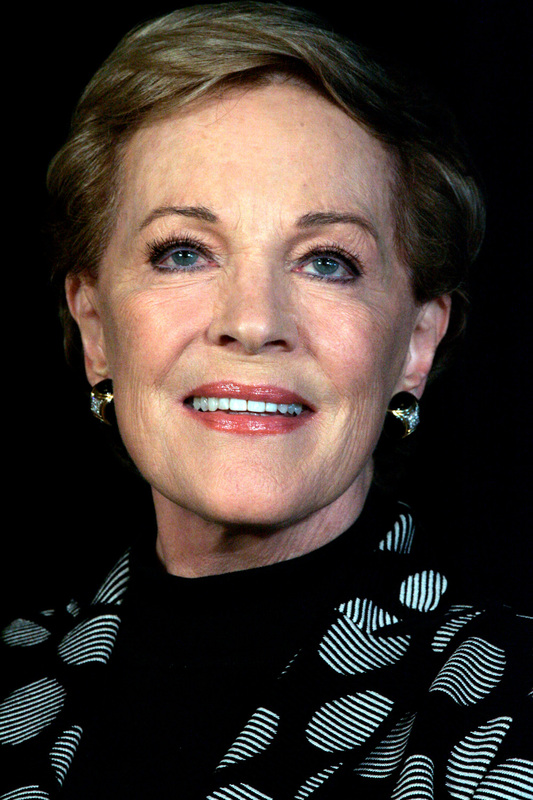 Dame Julie Andrews, (born Julia Elizabeth Wells; 1 October 1935), is an English actress, singer and author. Andrews, a child actress and singer, appeared in the West End in 1948 and made her Broadway debut in The Boy Friend (1954). Billed as “Britain’s youngest prima donna”, she rose to prominence starring in Broadway musicals such as My Fair Lady (1956), playing Eliza Doolittle and Camelot (1960), playing Queen Guinevere. In 1957, Andrews starred in the premiere of Rodgers and Hammerstein’s written-for-television musical Cinderella, a live, network broadcast seen by over 100 million viewers. Andrews made her feature film debut in Mary Poppins (1964), and won the Academy Award for Best Actress for her performance in the title role. She starred in The Sound of Music (1965), playing Maria von Trapp and won the Golden Globe Award for Best Actress – Motion Picture Comedy or Musical. Between 1964 and 1986, she starred in The Americanization of Emily (1964), Hawaii (1966), Torn Curtain (1966), Thoroughly Modern Millie (1967), Star! (1968), The Tamarind Seed (1974), 10 (1979), Victor/Victoria (1982), That’s Life! (1986) and Duet for One (1986). In 2000, Andrews was made a Dame by Queen Elizabeth II for services to the performing arts. In 2002, she was ranked #59 in the BBC’s poll of the 100 Greatest Britons. In 2003, she revisited her first Broadway success, this time as a stage director, with a revival of The Boy Friend. From 2001 to 2004, Andrews starred in The Princess Diaries (2001) and The Princess Diaries 2: Royal Engagement (2004). From 2004 to 2010, she lent her voice to the Shrek animated films and Despicable Me (2010). Andrews has won an Academy Award, a BAFTA, five Golden Globes, three Grammys, two Emmys, the Screen Actors Guild Lifetime Achievement Award, the Kennedy Center Honors Award, and the Disney Legends Award. Apart from her musical career, she is also an author of children’s books and has published an autobiography, Home: A Memoir of My Early Years (2008).